Even though people tell me using oil on your skin is supposed to actually help, I'm usually just not a fan. I hate the greasy residue that lingers for hours with most oils -- I just want my skincare products to sink in immediately and work their magic. Well, color me impressed -- because M.A.C Care Blends Essential Oils in Sweet Orange + Lavender does just that. I love the mix of fragrances in this oil -- the crisp, zesty, citrusy note of orange blends with the calming aroma of lavender to create such a unique and wonderful scent. I also love that I feel like I'm doing a chemistry experiment every time I use it -- because the miniature bottle is replete with an eyedropper that fills with the beautifully scented liquid! 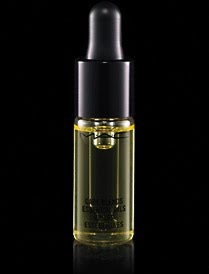 What I love most about this essential oil is how healthy it makes my skin look and feel. One eyedropper full, gently patted onto my skin, and I look like a million bucks. I like to apply it at night before my moisturizer -- it really helps to lock in the rejuvenating and hydrating properties of any moisturizer I've used thus far. And the fact that I've seen it used backstage at Fashion Week time and again doesn't hurt. M.A.C Care Blends Essential Oils in Sweet Orange + Lavender retails for $19.50.